The United States Golf Association and Great Britain’s R & A announced this week a new set of revisions to their common Rules of Golf, the 34-rule collection of commandments that govern this occasionally persnickety sport. Most golfers should welcome the changes, and to my mind the revisions take into account the vast improvements in video and television technology since the last major re-write. Here’s an example of why I think this is so. During this year’s British Open, Rory McIlroy’s ball moved on the seventh green due to a gust of wind, after McIlroy addressed it. The instant replays on HD television showed clearly that McIlroy had not in any way caused the ball to move from its spot. He was penalized nonetheless. The press release discussing the amendment to Rule 18-2b states there will be no penalty for ball movement after address, “when it is known or virtually certain that ‘[the player] did not cause the ball to move.” Instead, the ball is to be played from its new position. When television screens were a lot fuzzier than they are now, golf fans and addicts could perhaps be forgiven for assuming the worst as they watched a ball shift from its resting point as the player prepared for the putt. I’m sure that the new high definition TV screens, combined with ultra-slow motion, helped convince the Rules mavens to lighten up on this issue. Another change reduces the heavy hardship previously imposed for what could be described as minor negligence. Players who start their competition round late, but within 5 minutes of the scheduled starting time, will no longer be disqualified. Instead, the penalty for match play will be a loss of the first hole, and for medal play the player must add two strokes to his score for the hole. Other new rule changes will be discussed in future column or two. Claudio Smarrelli is back again as the golf coach for the Cape Henlopen High School Viking team for 2012. To help with the next season preparations, Smarrelli has arranged for the first Cape Henlopen Golf Team Invitational, to be held November 20 at Kings Creek Country Club. The first tee time is set for 10:55 a.m. The field will be limited to the first 24 players who sign up before the deadline of November 17, and is small enough to take into account the fact that by then the clocks have been turned back to Eastern Standard Time. The playing fee is $100 per player, which takes care of the round of golf and an extensive post-round buffet, featuring pulled pork, chicken, meatballs in gravy, deli meats and cheeses, salads, and hot beverages. Smarrelli promises that no hot dogs will be available. 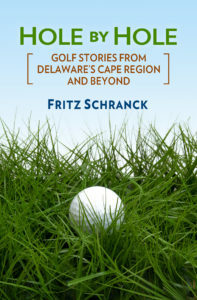 Donations and fees are payable to Cape Henlopen High School Golf, 1250 Kings Highway, Lewes, DE 19958. For more information, call the Cape Athletic Office at 302-645-5418 or Coach Smarrelli at 302-645-5418 between 10 a.m. and 3 p.m. Monday through Friday. Shawnee Country Club held its annual Ladies Closing Day tournament October 20, and Team Larson won the event with a sterling 31. Judy Larson led her squad, which also included Shelby Swain, Linda Cavanaugh, and Diane Fung. The Shawnee CC men held their closing day tournament on Sunday, October 23. The format was the traditional Shawnee Scramble. Each foursome played a regular scramble arrangement for the par 4s and par 5s. For the five par 3s, however, the teams had to use their two best scores. This meant that even par totaled 85 instead of the usual 70. Former Cape Henlopen golf standout Bobby Croce’s team won the net category with an amazing 62. His dad Joe joined in the triumph, along with Mike Pyne and Eugene Burdine. Charlie Gouert’s foursome won the gross category, with a six-under par 79. His group included Robert Owens, Robert Romberger, and Jim Broadhurst. The group I was in also participated but didn’t finish in the money; but after all, isn’t participation the greatest reward?